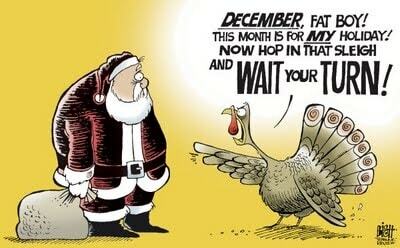 I love shopping and I love the holiday season, but I still found this hilarious! I think they should hold off on Christmas music until Thanksgiving passes. lol, I could practically hear that turkey yelling! HA! I love this too. I was irritated when I saw Christmas decor being set on the shelves before Halloween! I love holiday music, I’m all ready for it. Bring it ON! LOL – That’s too funny! Bwah ha ha! My husband turned on the Christmas music yesterday. But he’s been SINGING Christmas music since JUNE! I typically get January through May off from Christmas music, but without fail, he has started singing either Jingle Bells or some other Christmas tune by mid-June. It’s all I can do to keep him from playing it on the CD player or MP3 player before July! So funny, I want to start playing my Christmas music now. The kids asked me to at least wait until the day after Thanksgiving. I really hate to see/hear Christmas stuff before Thanksgiving is over. I love Thanksgiving with my family and wouldn’t want to miss it, but I love Christmas music and am already listening to the all Christmas music radio station lol.